I know I must sound like I say this every week, but I am SO excited to share this family's story! They have been on a pretty crazy journey since getting married and I am so proud of their bravery in sharing their story! And speaking of BRAVE... they are pursuing the adoption of 3 BROTHERS! So incredible. Click here to shop this week to give 20% to support their adoption. Our story begins like most…A young married couple longing for a family. We were lucky to find one another because we both have a huge heart for orphans. Sharing that passion, adoption was always in our plan. (We are talking, didn’t put a ring on the finger until we figured out how we would like to adopt!) Like most young couples we thought of trying for biological kiddos first. Now here’s the part where I tell you why we’re not like most young married couples. Well most young couples that don’t struggle with infertility issues. Greg and I first started “actively” trying in May 2011. I was diagnosed with PCOS (Poly Cystic Ovarian Syndrome) and the doctors recommend we try “fertility” treatments. We felt in our hearts that was not an option for us at the time. In June 2012 we had a little miracle, 2 little miracles to be exact, but we never got to meet them face-to-face here on this earth. For the next year and a half we go on to trying different fertility treatments only to struggle with getting pregnant and not staying pregnant. I wouldn’t necessarily say that “we felt God’s love the entire time” because we were upset and confused and honestly, we really just didn’t get it! One night in May 2013, after many prayers and many tears we had a thought, “Why are we trying so hard for a biological kid when there are kids RIGHT NOW who need a family?” That thought changed our lives for good. Our hearts ache for our kids that we will never get to meet, but the love that Greg and I had before this whole process has only grown. We believe that God never left our sides, even when we desperately tried to leave His. He remained ever faithful and ever loving. Many prayers, thoughts, and love have come our way over the past 3 years and Greg and I have been strengthened from it. Melissa and I are two peas in a pod! She has a shop where she sells sunglasses and all proceeds give back to adoption! I'm so excited to feature them this week. 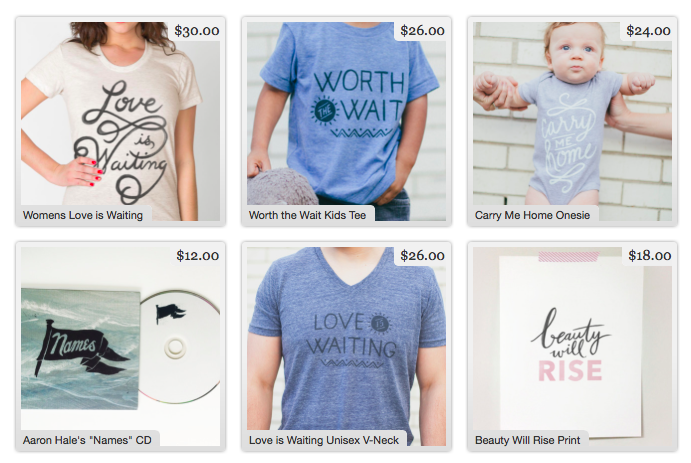 20% of all Love is Waiting sales this week go to support their SECOND adoption AND we're also teaming up to do an instagram giveaway! Can't beat a free tee and a new pair of shades! Read more about this cool family below and don't forget to check out subshades.com for another way to support adoptive families every week! "Adoption has certainly blessed our lives in more ways than we could have imagined. In March of 2012 we started the process (infant domestic adoption) and had many hiccups along the way. We were matched in January 2013 and our tiny bundle of joy arrived the next month, weighing in at 5 pounds, 12 ounces! Since then our adoption costs have been tremendous. Our sweet birthmother is a single mother to four children and had major health complications during her pregnancy. Being the adoptive parents we were responsible for all of her costs during that time. I joke and call Jacqueline our “million dollar baby” but in all seriousness, her adoption cost us nearly $60,000. 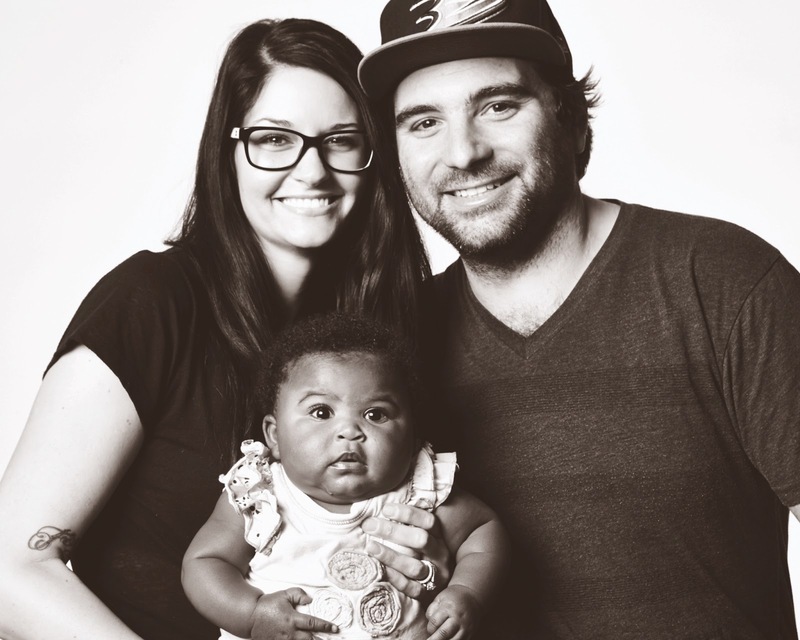 In June of 2013, Jacquie’s birth family became homeless on the hard streets of Detroit. With the help of family and friends we were able to fly them in to our home, to live with us while we raised funds to purchase them a residence. In the end, we were able to get the family a home but were unable to reach our fundraising goal. Robert and I were happy to help, however we were put in another tight financial situation. Here we are in 2014. Jacqueline is a thriving one year old. We want to start the adoption journey again! (Are we crazy or what?!) Robert and I are so excited to expand our family through another infant domestic adoption and give Jacquie a brother or sister of the same race. In order for us to do this, we need help. Our friends and family so generously donated funds for her birth family to purchase a home that we do not feel comfortable asking for straight donations. Instead all proceeds of Subsidy Shades will go directly to a fund to help expand our growing family. Thank you for everything! We love our family, friends and kind strangers so much! " After a surprise diagnosis of Cystic Fibrosis in their biological daughter, the Quesada's have found themselves on a grand adventure! They have completed paperwork and are waiting to be matched! Shop Love is Waiting this week and give 20% to the Quesadas. We are excited and blessed to start this adventure in growing our family through adoption! 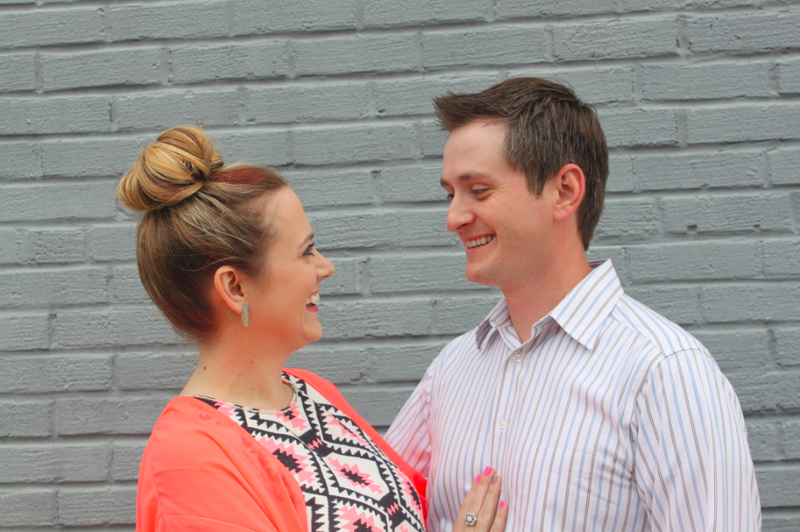 My name is Kristina, and my wonderful husband of 5 years is Levi. We have an amazing, loving, happy biological daughter, Ellis, who is 3 years old. When Ellis was born, she was diagnosed, to our surprise, with Cystic Fibrosis (CF) through a newborn screening. CF is a genetic disease that is passed down from both parents. Sticky mucus builds up in the lungs and digestive tracts, calling for treatments and over 15 pills a day. Although Ellis is doing extremely well, we have chosen to forego having more biological children. Through lots of prayer and reflection, our family has chosen the path of adoption! 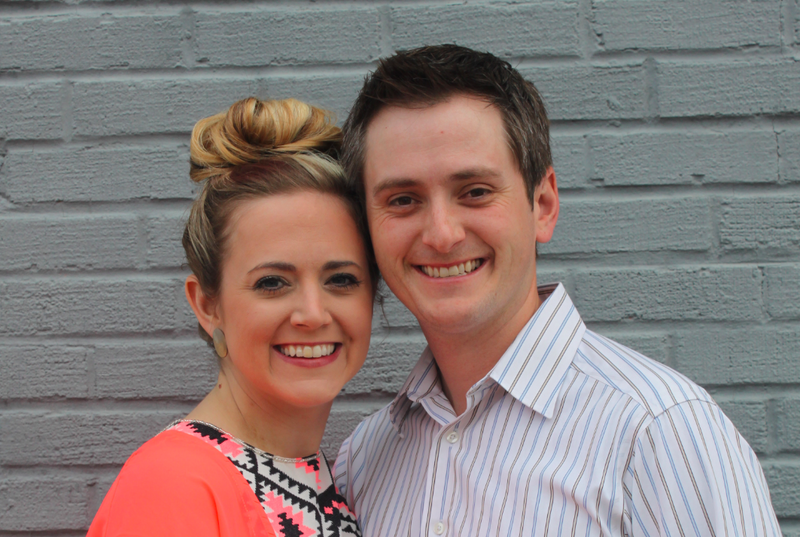 We have finally completed all of the calls, paperwork, interviews…and now we are a family waiting to be matched! We know that, when the time is right, we will welcome a wonderful child into our family. Thank you for getting to know our story and supporting our journey.